Day of rest. We had a Stake Conference. Total of 12.5. Benjamin did 9, Jenny 4, Julia and Jacob 1 - still recovering from the cold, William is much better although he still has a cough - but he was able to run 1 mile in 8:31. Stephen did 0.5. Joseph did 0.5 in the morning in 4:11, and then another 0.5 in the afternoon in 4:00. He can now run with a limp, but amazingly he managed 8:00 pace running like that. When I took him for 0.5 in the morning I was just hoping he could run sub-12:00 pace but he surprised me. I never would have thought that somebody walking with as much of a limp could actually run this fast. With Joseph later in the afternoon. He was still limping, although a bit less than in the morning, and ran faster with the same effort. Total of 13 today. Benjamin did 9, Jenny 4, Julia and Jacob 2, William 1, Stephen 0.5. Joseph is moving a lot better - was able to run 2 miles total - one in the morning and one at night. The interval. Benjamin's assignment was 5:20 - 5:00. He did 5:10 - 4:54. I did 5:17 - 5:29. This was his first somewhat serious workout after he got sick - I thought it was a good comeback. With Jacob and Julia. They are recovering from the cold. With Joseph and Jenny. This was quite remarkable - Joseph limped at sub-8:00 pace and was going as fast as 7:20 at the very end. A mile with Joseph at night - it was easier for him to get 2 in if he split it in two runs. Total of 12. Benjamin did 9, Jenny 4, Julia, Joseph, and Jacob 2, William 1, Stephen 0.5. We are gradually recovering. Joseph is still limping but the limp is going away and his form is becoming more normal. He is also regaining the range of motion in the knee joint. Total of 13. Joseph is recovering, was able to run 3+1, and a 7:17 mile with sub-7:00 pace for the second half. Benjamin and I did a workout - a quick 2000 down the canyon - he got 5:58 (3:03, 2:55), I got 6:21 (3:04, 3:17). Jenny did 4, Julia 3, Jacob 3, Joseph 4, Jenny 4, William 1, Stephen 0.5. With Joseph and Jacob. Joseph's struggled today with breathing and an odd headache. I am suspecting he is feeling the lost blood volume from his accident. His limping is decreasing, though, and his form is starting to look more normal. 1.25 interval. Gave Benjamin the target of first 1 K in 3:10 and second in 3:00. He did 73, 74, 73, 70, 68 - 5:58 (3:03, 2:55), repeat of course PR except this time not trying to PR. I was able to hang with him through the first 1 K - almost - he had 3:03, I had about 3:04, and then I was able to tough it out and not drop to slower than 80 quarter (5:20 mile) pace. Tail wind did help today. With Joseph later in the evening. 12 total. Jenny did 3, Julia 3, Benjamin 9, Joseph 3, Jacob 3, William 1, Stephen 0.5. With Joseph and Jacob. Joseph was struggling with a couple of things. He still that headache that comes after he has run for about a mile - probably a consequence of reduced blood volume, his range of motion is still not 100%, he senses that with those limitations he would not be able to beat his younger brother Jacob, and he is having a hard time accepting this reality. He really does not like to get beat by Jacob. I attempted to teach him how to develop a better competitive attitude like this. I said - imagine you and Jacob are in the Olympics in a 10000 meter final. With 2000 to go you find yourself in the lead pack alongside with Jacob and three other runners. You know that those three can outkick both you and Jacob. You know that Jacob alone cannot break them, and if he tries he would not only get outkicked by them, but by you as well. You also know that if you work with Jacob your kick may not be sufficient to beat him, but at least both of you will beat the other three runners so even if you lose to Jacob you will have Olympic silver. You see that Jacob took the lead and is trying to break the other three runners - thus your choices are - go help Jacob and get the Olympic silver while he gets the gold, or sit in the pack and end up without a medal, but beat Jacob. Which one would you choose? He said he had a hard time deciding. I asked, would you rather finish second or fourth? He said it depends on who beats me. So need to work on this mental block, and I think there is a silver lining in Joseph's injury - it will get him to think about this matter and hopefully he can overcome this addictive sibling competitiveness and learn to be productively competitive. 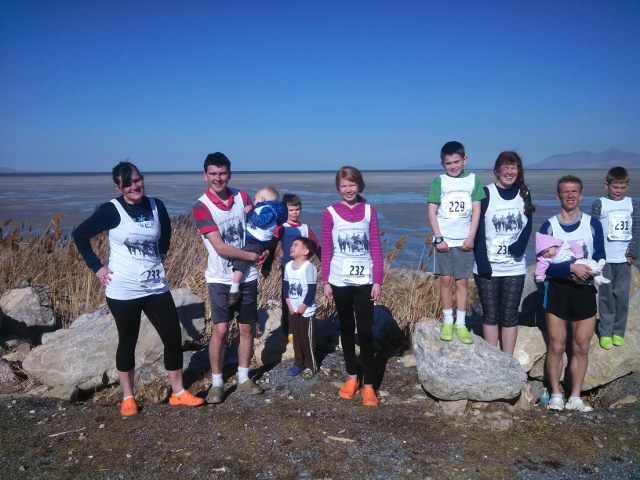 Today we ran the Salt Lake City Track Club 5 K. There were eight of us - Sarah, myself, and our oldest six children with ages ranging from 6 to 15. We averaged 22:13. This would probably be a record of this kind if such records were kept - average 5 K time on the same day for at least eight immediate family members with both biological parents running and the mother having given birth to nine, the youngest being four months old. I suppose since we do not know of anybody else keeping such records we could - if anybody knows of any family that has achieved some kind of a decent group performance time in spite of a challenging age distribution, use either the comment or the feedback form to report it. Right now the rules are a little fuzzy, but we will formalize them as we go. We need to have a lot of categories - e.g. if you require the mother of many children to run that changes the game because by the time she had given birth to all of them and raised them to maturity it would be very hard for her to run a time that does not drag the average down a lot. Conditions were windy today, so I estimate this produced a slowdown of anywhere between 20-30 seconds. Benjamin - 15 years old, turning 16 next month. 16:13, 3rd overall after Anthony Costales (15:30), and Jason Holt (15:43). Beat Fritz Van De Kamp for the first time in his life. Fritz was not having his best race, but it was not his worst either. Benjamin's splits were 4:59, 5:25, and 5:49 for 1.107 which is 5:15. His last 1 K was 3:07 which would not have been so decisive if had it not been into a fairly strong headwind. For a comparison, all I could do for the last 1 K was 3:37. Fritz did 3:32, Jon Gauthier did 3:21. Jason Holt was only 1 second faster than Benjamin over the last 1.107. First time that I remember in my 15+ years of experience with Utah LDR Circuit races that somebody 15 or under made the podium in a circuit race. Myself, age 41 - 17:37, 13th overall, 3rd master. Splits 5:17, 5:47, 6:33 for the last 1.107 - 5:55 pace. Craig Green won the masters with 16:47, Dan (2nd place) ran 17:25. Even though I slowed down a lot into the headwind I got passed by only one person which was around the 3 mile mark, and I was able to latch on to him and finish maybe only a second behind while we closed on some other runners in front of us. So the slow down in the quality of effort was perhaps not that drastic as there were plenty of relatively strong runners behind that would have passed me otherwise. Jacob, age 8 - 21:12, 1st in 1-14 division. 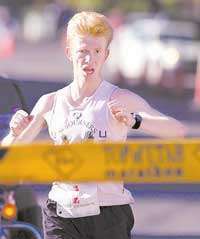 Experienced a cold in the week prior to the race, but recovered enough to be competitive. Opened with 6:34 mile, then somewhere around 6:50 for the second, which makes it 7:48 for the last 1.107 - 7:02 pace, quite respectable for an 8 year old into that headwind. I saw him twice - once while I was racing, and the second time when I was running back to meet Sarah. He looked smooth both times. Joseph, age 10 - 22:04, 2nd in 1-14 division. For him this was a lesson in humility. He was recovering from his bike accident 11 days ago in which he punctured his upper quad, lost a good amount of blood, got 7 stitches, could not walk for 2 days, and could not run without a serious limp until Wednesday. His biomechanics were still affected, and I could tell that he had lost some endurance largely due to the lost blood, and possibly also as a result of inactivity when he could not walk. So considering all things, this was a miraculous performance. However, Joseph had to deal with the fact that his younger brother Jacob beat him. This had never happened before. Joseph has a problem with unhealthy addictive sibling rivalry. Perhaps this experience will teach him to make some adjustments in the way he thinks and make him a more healthy competitor. Julia, age 12 - 22:54. First in 1-14 division. Her opening mile was 7:00, do not know her other splits. This was a significant accomplishment for her. She has had to reduce mileage over the last couple of weeks due to a cold. Over the last few years she has struggled with anemia - now she is able to control it with an iron supplement and a diet focusing on iron. She also has some kind of a condition that nobody has been able to diagnose that makes her not function well unless she gets 12 hours of sleep at night. Jenny, age 14 - 22:55. Opening mile 6:55, then Julia passed her and gapped her, but Jenny closed most of the gap with a strong kick, but ran out of road. This performance is a significant achievement for Jenny. She has struggled with anemia as well, and has just barely began to come out of it with the help of a supplement and dietary modifications. We are learning something about girls. They naturally tend to eat like a mouse when they need to be eating like a lion. Especially if they are training while going through puberty. That skill needs to be taught, few girls have it naturally. Jenny also has struggled with the feeling of panic when the pace gets fast and her breathing goes out of control. She dealt with it by thoroughly studying Elder Holland's talk "Lord I believe" and thinking of it whenever she felt that feeling during the race. William, age 6 - 27:02. This was a great result for him, I thought. From his training I knew he could run under 26 on an ideal course, and 100% healthy. He had just barely recovered from a cold, and he is very sensitive to respiratory obstructions - they drive him nuts, when he finds anything in his nose he blows it like crazy for a long time. To make things more difficult, he has a very dramatic personality. It is a miracle that we have been able to convince him to run every day, I think this has taught me how to get anybody to run. So now under those circumstances he goes out and races a 5 K running the second half into a tough headwind that humbles the strongest runners in the state, and he does it alone without a parent or sibling being by his side to pace him or block the wind for most of the way - except for the last half mile when Benjamin came back to him. Somehow William pulled it off. Before the race I asked him what he wanted for his prize and he said three bottles of honey. I think that helped him deal with the adversity, and he courageously toughed it out. Sarah, age 39 - 27:50. Sarah has given birth to nine children. Our youngest, Mary, is only 4 months old. That alone would make racing tough, but on top of that she picked up a cold a couple of weeks ago. She had not been able to shake the respiratory symptoms until about three days ago, but there was another twist to this. Even a simple cold puts a lot of stress on the hormonal system. It is common for a runner to experience the flat feeling when running hard after a cold for a couple of weeks even after the fever and the respiratory problems are long gone. For a woman that has recently had her ninth child this takes on a different dimension. Sarah felt sudden onsets of fatigue, sometimes lasting several hours over the last couple of weeks. She reduced her training to accommodate, and tried resting more, but ultimately she just has to let it run its course. She was still not 100% over it today, but she was able to deal with it and run a decent time. I ran back to her after I finished my race and paced her for the last half mile or so. Back to Sarah, and then paced her.